This is a work of true beauty. Not just a gem, but a delight that will uplift even those only marginally interested in Tolkien. If you need to buy a present for a friend, partner, lover, child or parent who enjoys the literary works of Professor Tolkien, then this is a must. Perhaps you should buy two, the second for yourself. At £12.00 a copy it is a steal. This is a selection of illustrations and maps from the hand of Tolkien himself, interspersed with a brief biography and short commentaries on his best known work. In many ways it allows the reader to understand the full Tolkien, the man, the scholar, the philologist, the writer and the husband. Did you know that Tolkien was born in Bloemfontein in the Orange Free State to English parents shortly before the Boer War started? When he was three, Tolkien and his younger brother were taken back to England by his mother which at least meant he was safe from the horrors of that war. When he was four, his father died of rheumatic fever and his mother died of diabetes when he was twelve. Not the best start in life, but he was a bright boy who won scholarships so did well to arrive at Oxford as a Classics undergraduate in 1911. As a youngster, he had already found Edith, the girl he wanted to marry, who became his vision of Luthien, the Elven princess. To develop a wider linguistic knowledge he transferred to the English schools and graduated with a First Class degree in 1915. Tolkien the scholar and now husband was finally established but sadly, his generation had other work to do. He joined the army to become a junior lieutenant in the 13th battalion of the Lancashire Fusiliers. This was the most dangerous job in the British army at that time. Young officers such as he had a life expectancy of six weeks. Tolkien was able to do better than that but was stricken by trench fever so was invalided home towards the end of 1916. On his recovery, he was fortunate to be allocated to a defensive regiment allowing him to spend the rest of the war back in Blighty with his young wife. To be an orphan and a participant in a brutal war are probably two strong motives to be creative in any form. To these, Tolkien was able to add both the gift of language, a capacity as an imaginative painter and the experience of passionate love. We are all familiar with his immense scholarship in language and its deeper forms, but we have only seen his drawings and maps as illustrations in his books. His maps of his mythical landscapes are exemplars of the period in our culture before digital mapping when cartographic illustration was both an art form and an instructive tool. Would that this capability be recovered? His painting is water-colour. It is to the standard of a gifted amateur. It is not indicative of any sort of instruction other than the execution of simple images. His art has avoided the corruption that professional training induces and reflects a simple joy. A particular delight published in this book is `The Gardens of the Merking’s palace’, a fantasy he drew for his children. It is very good. 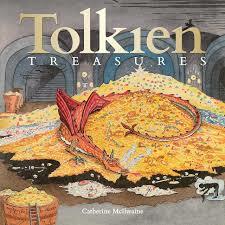 The abiding impression illustrated in this book are Tolkien’s loves: Edith, his family, language and legend. This book displays a life lived to the full and which in turn, has provided us all with a vision of our own potential. Treasures indeed.